Offering the same performance as our 3.3g product, PURTABS 13.1g allow you to mix large batches of solution at a cost comparable to that of even commodity bleach. PURTABS 13.1g offers powerful performance, six different solution concentrations, and is economical and sustainable. These disinfecting and sanitizing tablets eliminate the costly barriers to proactively disinfecting and sanitizing more of your facility than ever before. THE FUTURE OF INFECTION CONTROL IS HERE AND IT IS SUSTAINABLE AND SAFER. 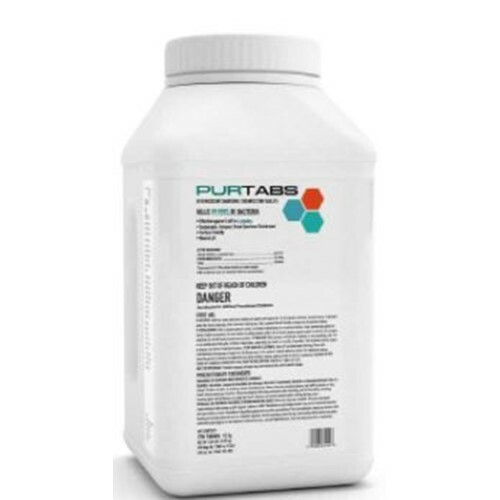 PURTABS is designed to be the most convenient and cost effective option to ship, store and apply a less toxic, more potent disinfection solution. Protecting environments and people from harmful pathogens has never been easier or more affordable. Depending on the concentration, HOCL kills 99.999% of bacteria and destroys C Di. in 4 minutes! PURTABS multi-purpose tablets have many various uses and are available in 3 tablet sizes for easy mixing and precise dilution. PURTABS targets the most virulent microbes that affect every sector, from no-wipe sanitization for restaurants to high powered hospital grade disinfection, and everything in between.